Bongeunsa and a thousand days of prayer – Wake Up and Laugh! I first posted this on my now deleted personal website (‘Marcus’ Journal’) in September, 2009. Apologies to all those who have read this before. Founded in 794, I first went to Bongeunsa temple in 2002 and was amazed at such beauty in the centre of Gangnam. At that time I was in Korea with Dao, from Thailand, and sometimes went with her, and once I went with my best friend Colin when he came to stay on a visa run from Bangkok. And I’d often go alone. I’d find a quiet place to sit and I’d listen to the chanting going on in the halls and look up at the trees and the temple roofs. I started going more regularly, this time with Ikumi (from Japan), when I went back to Korea in 2007. We’d go whenever we were in the area and one time, while we were still finding our way around the order of chants in the evening services, a kind Korean woman came over to us who could speak Japanese and penciled in for us what and when to chant, when to sit, when to stand, and when to bow. Later, I used to go every week with my Dharma friends after Saturday Sangha discussions at the Buddhist English Library. We’d travel across the city together, stopping for coffee before going into the temple, and almost always pick up some Buddhist nick-knacks in the temple shop. I can still remember the smell of the main hall, a smell of evening sunshine, warm wood and incense. The temple drums would be sounded outside as everyone settled into quietness, with laypeople sitting towards the sides of the temple and the monks on cushions of a different colour in the middle. The deep sound of bells marked the start of the service and the first chant was the Heart Sutra. That was followed by the Thousand Hands Sutra and then came the Kwan Seum Bosal chant with 108 bows, a practice I always dedicated to my sons. To make a full prostration, oh-che-tu-ji, in a Korean temple, you start from a standing position and, with your palms together in front of you and your back upright, kneel on the floor. Then place your hands on the floor and bend until your forehead rests between them. Next turn your palms upwards and lift them from your elbows to the level of your ears. Put your hands back down and lift your body back into a kneel. Then stand and repeat. I remember the very first time Ikumi and I tried to do a full 108 bows during the Kwan Seum Bosal chanting. After just fifteen minutes I’d totally lost count of the number of prostrations and my admiration for the mainly elderly temple regulars had skyrocketed. My leg muscles were trembling and I was worried I’d be sick. The ajumas in front of me were making two perfect bows to every one of my sloppy ones, and I redoubled my efforts. We made it, but only just. After some half-bows, ju-doo, to the people around us with the wish that they may become Buddhas and three final painful full prostrations to the Buddha, Ikumi and I clung to each other as we shakily approached the temple steps. The slope down to the gate was agony. We crossed the road and headed straight for the nearest coffee shop, glad to be able to sit for a while and take the whole experience in. Over the following months I got better at it, and by the time I took formal refuge in May 2008, performing 108 bows was a lot less of a challenge. That’s not to say I could do it particularly skillfully, and I certainly couldn’t match the incredible bowing of the monk with the glasses who was always there at the back of the hall every time we ever went to a service at Bongeunsa. I later learnt his name was Venerable Myeongjin and that he was the abbot of the temple. His bows were perfect. Every prostration identical to the one before and the one after, and all in perfect timing. He was like a metronome for the rest of the hall, the model that everyone aspired to copy. He also looked like a really nice person, with a ready smile and a calm manner. What I didn’t know was that Ven. Myeongjin was carrying out a 1000-day prayer retreat confined to the temple and performing not 108, but a full 1000 prostrations each day. This incredible practice started on December 5, 2006, and ended on August 30, 2009. During that period he left only once, to attend the funeral of the former President on May 29, 2009. The aim, he said, was to make the temple a place of genuine practice. And from what I saw and experienced there, he achieved his goals. The people I met in that temple, both the regulars and others, were not just welcoming, but also clearly committed to practice. The main hall was always full of people bowing, sitting, and quietly chanting, and there was never any noise and always a feeling of complete devotion. 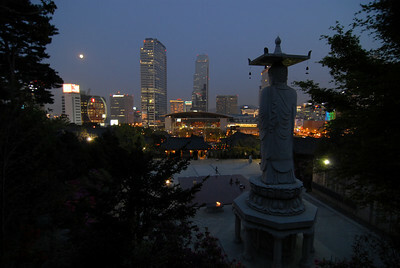 Venerable Myeongjin’s period of practice also saw membership of the temple rise from 200,000 in 2006 to 250,000 members now. Likewise, temple income also rose and, under Myeongjin’s leadership, all financial records were made available to the public. Again it seems to confirm what has been my overall impression of Korean Buddhism, an impression of openness, strength and a seriousness about the Dharma and its future. Ikumi used to wait for me on the bench outside the shop before going together to the main hall, and after the service we’d walk around the temple buildings, or sit together quietly. Joseph met a woman there one week who later became his wife. Carl performed prostrations with a determination we all admired. And Joe knew the chants off by heart, and I’d follow his voice as I stumbled through them myself. There are very few places in this world I love more. Photo: The amazing picture at the top of this post was taken by my friend Joseph and is used here with permission. For more of Joseph’s great pictures of Bongeunsa, and many other places too, follow the link below. Highly recommended. I’ve been thinking about this post (from your previous blog) a lot lately. EunBong and I still make our way to Bongeunsa as often as we can, and still have a very warm feeling there but lately it’s been a bit disappointing. There’s been a lot of “they said this”, “he said that” stuff flying back and forth between Bongeunsa, Jogyesa, and the government. Ven. Myeongjin has responded through the media and also by posting giant letters around the temple grounds. It seems like it was this sort of thing that started all the trouble in the first place. Thanks for that. I had no idea all this was going on now, but I remember, even back then, once seeing a political cartoon on the wall of the temple against the government (during the mad cow demos) and feeling that that was hardly the right spirit for the place. And yet, such spiritual energy in that place over so many years, the very buildings speak such deep Dharma don’t they? And there can be no doubting the devotion and seriousness of the ordinary people there. But yes, there I go elevating people and places again – how could that ever lead to anything but disappointment! LOL! Still, I stand totally by this post – Bonguensa remains one of the most beautiful and meaningful places I know. and, as you said, the energy there is well worth dropping by for! Marcus, you know that practice is done with mind, right? just was curious about the temple, wanted to read more, and found their website, it is very nice, but the feeling I got that it is more of a tourist attraction than a real practice of mind, it is not that I feel against devotion and prostrations in anyway , but that everything about that website seems somewhat commercial, it is just my opinion. It remined me of the first zen buddhist temple I went to, it was really nice, I went on retreat for a week, was great, but then it felt that it does not go anywhere, people would come to sit in meditation, chant, and meet, sometimes it even felt like dating service, eventually I stop going there, I found HanMaum Seon Won, and it felt totally right, I felt happy with the teacher and the teachings and the practice, even if sometimes it is not so sparkly wonderful there, I annoy sometimes a monk or too, but it is like my family, and it feels like home, so sometimes I stay there, sometimes I wash the toilet (great practice too), sometimes I dig or plant in the garden (love it), but the best is the results of puting to practice those teachings, sure I have a long way to go, but I know I have the best directions. If you visit BongEunSa with a ‘tourist mind’ you’ll probably have a nice touristy experience, and if you visit with a practicing mind it’s also a very wonderful place for practice. Korea has one of the highest suicide rates in the world, 34 people everyday. A few years ago, my wife was experiencing the worst period of her life. Of the things she was dealing with, many people would have ended their lives over any one of them… instead, she traveled over an hour on the bus every morning for 3:30am ceremony. The monks at the temple, especially Ven. Myeongjin probably saved her life. BongEunSa does have a very strong history of sincere practice, and if you actually visit it, not on a website, you can feel it. 34 people a day? Wow that seems like a lot, doesn’t it. Actually, Bongeun-sa was also the temple that Hanam Sunim stayed at when he was in the Seoul area in 1925-26. (It wasn’t inside Seoul then.) To convince Hanam Sunim to stay there, they must have had a serious meditation hall and a good attitude towards practice. Suicide is something I do understand, but often people do it not because they have difficulties to deal with terrible problems, but because they are not excited about life activities, which are mostly based on desire and really want the way out of it all. (Although there were times that I wished for quick death instead of those sufferings). My life was saved by a dog, for others he appeared as a dog, a very smart and beautiful one, but for me it was buddha and bodhisatva, I was way beyond wanting any kind of practice or ceremony. When I read in KunSunims’s teachings that this practice “is basically killing yourself” (of your false “I” and not physical self (DO NOT kill yourself or something, people) I felt that that was the way to deal with everything and a proper way of “suicide”, for me it was the best pill, and I think if those suicidal people would know this teaching, they would be good practitioners, if only they would know that physical death does not kill your mind actually (the suffering would go on), but only ‘killing’ the false self can provide relief. I visited only one temple in Korea and after being there just for about 24 hours, after meeting with KunSunim and everything that happened there, I felt, well, I have no words what I felt, but if somebody were to ask me who is the best master, or rather who has the best medicine, you can guess what I would say, because the scope of help that I was given was beyond my comprehension, it took me a year to process, and still working on it.